Finding unique wedding photo ideas that are fresh and new can be a real struggle these days unless you've found a good photographer that is creative with his work. You can go with the tried and true traditional posed portraits at weddings, but some brides these days are looking for fresh, new exciting portraits and candids that will set their wedding apart from the weddings of their friends and family members. Black and white photojournalistic style portraiture is popular these days, as are black and white portraits with selective hand colouring. Ask your photographer for some wedding photo samples or poses he has tried before or click here to try this great book with around 500 wedding poses. But beyond the images you see everywhere, what can you do to impress the bride and groom with your creative wedding photography techniques? You could try producing a shot like the Angel Bride below. 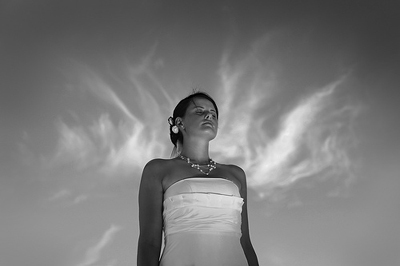 Take a shot looking up at the bride and use Adobe Photoshop to add the cloud effect to the background. Simple, but creative. First, you’ve got to start thinking outside the box. Approach your wedding photography with a new angle on a traditional gig. For example, find a high vantage point (the higher the better) and shoot the bride and groom looking up at you, standing with their arms around each other. You could do this shot from the balcony in a church or courthouse or another venue with the bride and groom posed on the first floor and the camera angled down at them as you shoot the photo from above. You might also consider bringing a step ladder with you to wedding shots or shooting a portrait from an outside balcony or the roof of a building if you do outside portraits to achieve this same effect. Have the couple kiss for one of these shots, too. Try shooting a very formal portrait of the bride and groom standing together side by side on a solid, neutral background. Then photograph the wedding cake against a solid background. Using Photoshop, remove the cake topper from the photograph of the wedding cake, isolate the bride and groom in the first picture and shrink them down to size, and then superimpose that image on the cake photo so it looks like the bride and groom are the cake topper on their own wedding cake. This would make a fun image for the couple’s "thank you" cards. 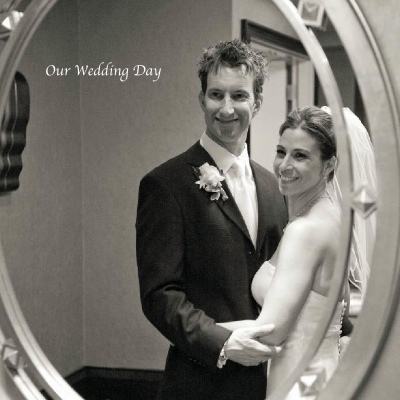 The image below is a useful and creative way to frame the wedding couple in a picture using a wall mirror. Photos of the bride and groom’s hands held over the bride’s bouquet to show off the wedding rings have become standard fare for weddings, and while these are beautiful images, why not try a new twist on that wedding photography idea? For instance, have the bride and groom remove their rings for a few minutes at the reception. Try photographing two champagne glasses with about an inch or so of champagne in them, sitting side by side in front of the bride’s bouquet, with the bride’s ring in her champagne glass and the groom’s ring in his. Another idea is to stick the two rings side by side into the frosting of the cake so they are standing up. Use a macro lens to photograph the rings really close up with the frosting as the background, predominantly isolating the rings. You can see another creative idea for photographing the Bride's wedding ring below. 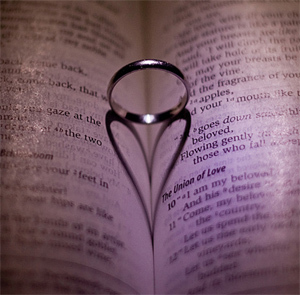 Using a light behind the ring, you can create a shadow on the Bible that looks like a heart. Not all of the memorable portraits of the bride and groom have to include their faces. You can create some great, poignant images of the bride and groom walking hand in hand along a beach, river’s edge, or even down a path in the woods by having the couple walk away from you and shooting photographs from behind. Similarly, you can get some touching shots of the couple sitting on a garden bench in a flower garden talking and looking at one another or holding hands when shooting from behind. Seek to capture the moment, not necessarily every detail of the expression on their faces. Make use of shadows and light patterns to create an artistic sense of the scene. Magazines often shoot great exciting images by juxtaposing two elements that normally would not correlate. For instance, they might photograph a woman in a formal evening gown standing in the middle of a hayfield. Similarly, you can do the same with your wedding photo images—assuming the bride and groom are game for a little experimentation, that is—or if you know that they want some really unique images. Think of a place you’d never see a bride in—normally, that is. Then photograph her—or the couple—in just that kind of place. For instance, wouldn’t it be cool to photograph the bride standing on a rusty old fire escape on the side of a really old building? Her stark white dress would make an incredible contrast against the old brick and make for an exciting "grunge" type image. More good wedding photography ideas involve photographing the bride and groom in a junkyard or a deserted ghost town or even an amusement park. The key to successful images like these is a bride and groom that love the idea and embrace the concept. It doesn’t hurt if they have a touch of wanna-be-model in them, either. They’ll be able to better relate to imagery that looks like it came out of a "Hollister" or "American Eagle" ad than their mother’s wedding album. And these are definitely creative wedding photography suggestions and poses at their best. Someone has to try these fresh wedding photo ideas first. If you’re a professional wedding photographer and are thinking these wedding photography ideas are just too far "out there" to try, consider getting models to pose for these kinds of shots so you can make prints and them show your samples to prospective brides and grooms to see if they like them. Try all sorts of new wedding photo ideas with models and see how they turn out. Remember, as with any new trend or idea, someone had to do it first. You just might be a trendsetter yourself with some of the wedding photo ideas you come up with. Armed with these books, you should be able to meet with your photographer and explain to them what poses you expect them to capture on your wedding day. The Master Posing Guide contains many creative modern and traditional photo ideas and examples that can help you get inspiration for your big day. It's most useful for helping you and your photograper find and compose the best and most memorable poses for your own wedding album. If you are looking for old school traditional wedding posing ideas, then you will really love this book. As it says in the title, it has 500 wedding photos to start your creative juices flowing when it comes to deciding what type of pictures you would like taken at your wedding. Are You Photographing Your First Wedding? Being asked to photograph a wedding can be a little daunting on your first outing. 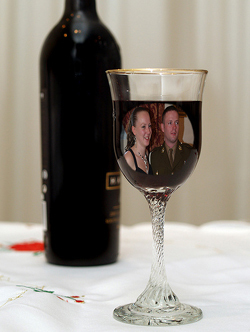 Going unprepared or not knowing which shots to take could be embarrasing for you and could spoil the bride's big day. A friend of mine, Nick Stubbs, who is a professional wedding photographer is offering his help and guidance with the Wedding Photography Blueprint so you can capture your first wedding with confidence. If you’re shooting your first wedding, then you need some expert advice from a professional wedding photographer. Nick Stubbs is that guy and he shares his best tips in this e-Book. Use this wedding photography checklist and make sure you capture the mostimportant wedding photographs. Easily remember everything from the first kiss to the exchanging of the rings. Creating unique and original wedding photography poses will make any pictures you take at weddings more memorable. If you are a bride to be or a photographer, then try some of these photo ideas.